This deck is an original work of art designed to facilitate Divination, evoking the mysteries of ancient oracles, created by Charles J. Freeman (1941- 2010). Charles Freeman spent many years developing a full series of illustrations which are quite different from all previous decks in this genre. 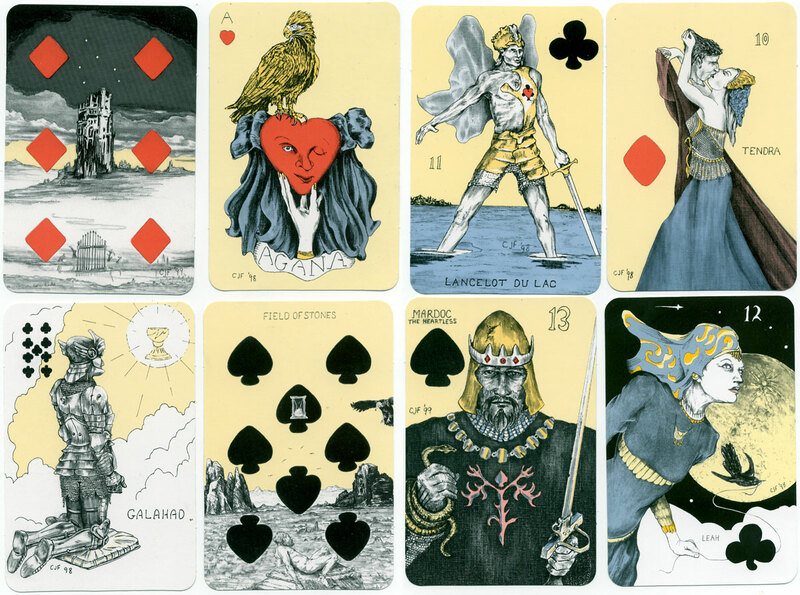 Above: the Picture Book of Ana Cortez, a pen and ink style illuminated pack of playing cards designed to facilitate divination by Charles J. Freeman (1941-2010). 52 cards + title card first published by Two Sisters Press, 2002. The deck was reprinted by U.S. Games Systems and is available now from the publisher and Amazon. It is a smaller version than the original printing, a true "playing card size." The first publishing, by Two Sisters Press, is available only to members of the online Workshop offered through www.anacortez.com, as they are extremely limited. Interpretations for the suit of spades taken from “The Playing Card Oracles” by Ana Cortez, suitable for use with Playing Card Oracles - Alchemy Edition or with any normal deck of playing cards. A wanderer, one without a permanent home.